Three months ago I challenged myself to a six month goal to do 25 unbroken strict pull ups. As part of this challenge the plan was to test at 3 months and hopefully be at least halfway from my 19 pull up starting point, which would have put me at 22. Turns out it only took 3 months to get up to 25 pull ups! I followed a very specific program from Gymnasticbodies.com called foundations 1 over the course of the last two of the three months. Funny thing is, none of my work incorporated pull ups on the bar. All of my work was done on rings with my feet on the ground. Through working to the progression of an exercise called a "hinge row" and as well as an "incline ring row" and achieving mastery in each - meaning 5 sets of 15 with only about 60 seconds of lat stretching in between - my pulling strength and endurance increased dramatically. To say I didn't do any pull ups during this time would be an exaggeration. I did do some weighted pull ups just to satisfy my curiosity of how my strength was maintaining with such high volume at a lighter load. It was fine. Alternating on the minute with sets of 10 back squats I was able to complete sets of six strict chest to bar pull ups for six sets. Previously my best chest to bar single rep was only 65 lbs. I'd say that's a significant improvement, although I haven't tested a one rep to see for sure. Not to sound too much like a sales rep for GB, but the program is really legit. It is extremely detailed, with video examples of true gymnasts performing the specified skill correctly and can be scaled very appropriately to your own skill level. 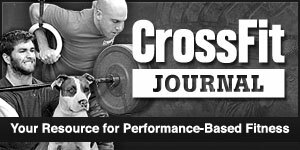 Many of the exercises that appeared easy at first crushed me when performed with the specified precision and limited rest. The amount of control and strength required to perform simple movements incredibly well is astounding and the training benefit for me has been extremely rewarding. I'm going to keep up the gymnastics training and at the six month mark, which will be July 2nd, I will retest and shoot for 30 strict pull ups. It's a lofty goal, but I'm feeling confident and I know my training will be consistent and I am up to the challenge. Feel free to consult with me in the gym or through email if you have an interest in developing your body weight skills further. It translates so well to the barbell and all of our skills in CrossFit, if you have the time, you really should give it a shot! Set it and Achieve it! Several years ago I was fortunate enough to be invited to one of Greg Amundson’s original Positive Self-Talk Seminars at CrossFit West in Santa Cruz. If you haven’t heard of him, he’s known as the Original Firebreather, one of the first guys to really crush CrossFit workouts. He’s big on having a strong mental approach and a lot of his principles have really stuck with me over the years. When I decided to make a goal to improve my pull ups at the beginning of the year, I thought, what better way to accomplish a goal than to do it while sharing an approach I learned from a proven Firebreather? Now, if you’re going to be setting a goal for yourself, the first thing you need to do is find something that is truly meaningful to you. Do you care about it enough to work extremely hard and make sacrifices to achieve it? Perfect, that’s it. Now you have to clearly define it. Use clear language and describe what you want as precisely as possible. When you achieve your goal you want to know it. Don’t leave room for doubt with wordings like, “I want to get better at my CrossFit.” Say “I will finish Fran as Rx under 3:00!” Then go do Fran and find out where you’re at. Once you know where you’re starting and where you need to go, you can make a realistic assessment of your goal. If your Fran is at 3:12 your goal will be short term. If you’re closer to 6:00 you’ll need to break your goal into some intermediate stages. Improving Fran by 3:00 will require very different improvements for different athletes. An extremely strong athlete with poor pull ups will be focused on the gymnastic aspect of the workout, whereas a small or weak athlete will have to work on building the strength and power to better handle the workout. If all that is needed is better kipping technique, this can be accomplished in hours or days and applied. Smoother technique can cause significant drops in time and will significantly shorten the time this goal will take to achieve. If strength is the issue, there will be a much longer strength building process that must take place for any improvements to be realistic. After establishing your goal and finding out where you stand in relation to it, you must determine if your goal is going to be short term or long term. Can you just keep doing more of what you're doing to achieve it? Or do you need to create a focused effort specifically to accomplish your dream? Word your goal powerfully, write it down in the places you spend the largest amount of time and share it. Saying your goal with confidence drives you and lets yourself and others know you mean business. Having your goal visually represented will serve as a constant reminder. And Sharing your goal will keep you accountable. If you know someone is going to be asking about your progress you’re going to be damn sure to have some progress to tell them about. So here’s my goal: I will achieve 25 consecutive, strict, full open arm pit pull ups with a shoulder width grip! Looks like 19 reps for me. 6 reps will be a significant improvement, but if I achieve just 1 more per month I can be there in 6 months. If I’m going to be on track to make it I’ll need to have at least 22 consecutive reps by the half way point. I really want to achieve this goal, so I’m going to share this post with anyone who will read it. If you see me, ask me how my pull ups are coming. I’ll be excited to tell you about them and I’ll be encouraged to see my goal through to completion. Share yours with me at Amity as well and we can help to hold he each other accountable.